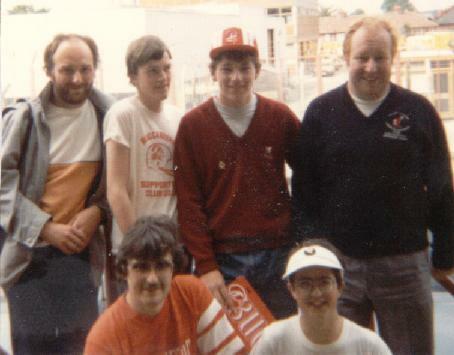 The Bucs UK Fan Club was formed in December 1984 with an initial six members. Since that date, we have been officially recognised by the Buccaneer franchise and have enjoyed huge support and a fantastic working relationship with them for which we continue to be grateful. Bucs UK membership is by annual subscription and members are entitled to take part in regular club events and competitions, as well as book game tickets and join in the regular club trips to Tampa. Non-members are welcome to join our message board and join in the discussions and game threads. Go Bucs! 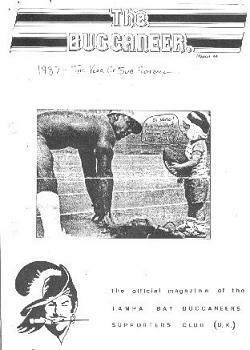 The main function of the club for many years was its' monthly magazine, "There's Always Next Year". But after 197 issues, we switched to being online. We hope you like our website. 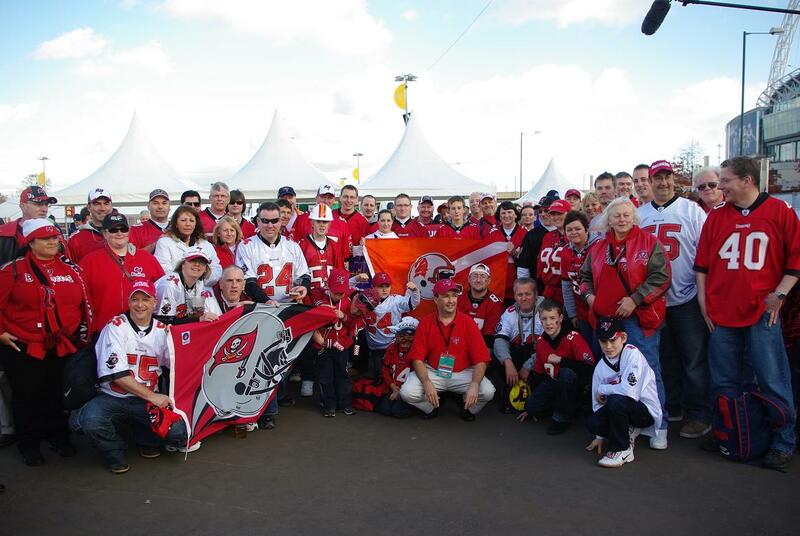 The Bucs UK fan club now boasts members all across the British Isles and helps to arrange game tickets at Raymond James Stadium, produces its own range of club merchandise, and has regular meetings and events around the country. It is a fan club for the fans run by the fans. We have written a review of the Bucs UK with stories from the history of the club, how it all began, who was involved and some of the memorable moments of the organisation. The current club committee are listed below. We're a friendly and welcoming bunch - so please do sign up and join us. 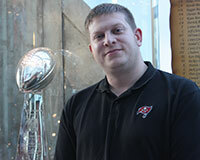 Phil is the head honcho who runs the Bucs UK. He has been a member of the Bucs UK since 1991 when he heard another member rambling on a US radio station about the club. He has assisted with the running of the club for the last 20 years particularly with tickets and merchandise. Phil is also a fanatical Manchester United supporter and has been since 1963 - not since the takeover as some people suggest! David has a great relationship with the Bucs Front Office and helps plan trips to Tampa. He started following the NFL back in the 80s when it was on Channel 4 and remembers trying to follow games on a very bad radio Armed Forces Radio signal! 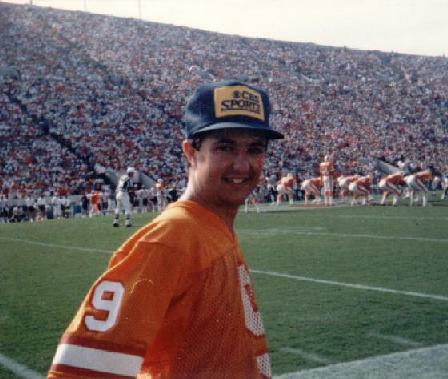 His allegiance to the Bucs started in 1997 when he went to his first live NFL game. 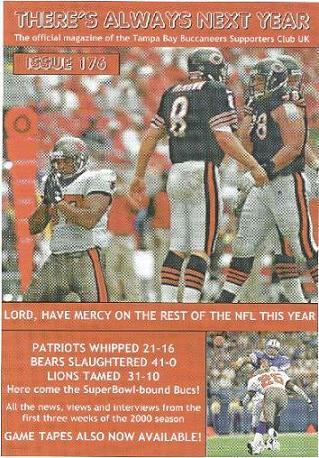 Unfortunately that day the Bucs were mauled by a 3TD display from Barry Sanders. He was three rows from the back in the old sombrero but the Ray Jay was being built in the background. 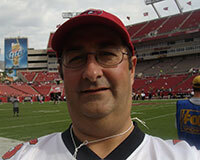 He is a regular visitor to see the Bucs in Tampa and in 2012 clocked up his 38th NFL game. Highlights have included Michael Spurlock's TD KO return (the first in Bucs history), Matt Bryant's 62-yard FG to beat the Eagles and Mike Alstott's two-pointer in a memorable comeback against the Redskins. Kieron runs the Bucs UK website, forum and social media pages. He's normally quite shy but doesn't mind being poked! He first saw the Bucs whilst on holiday in Florida in 1990, having turned up to see the Bucs scrimmage the 'Fins at Pepin-Rood. He promised to support the winner, and here we are. The rest is history! He spent most of his youth refreshing teletext on a Sunday night to find out the Bucs score and then waiting until First Down or The Buccaneer Magazine would arrive in the post so he could find out what actually happened. He is strangely proud of the fact this his wardrobe only contains three non-Buccaneer items of casual clothing! He used to play for the Kent Exiles 'Britball' side and now helps out as club photographer. 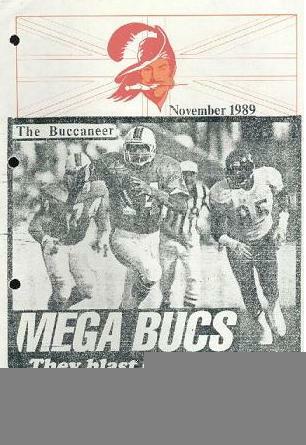 The original idea for the formation of the Bucs UK came in 1984. 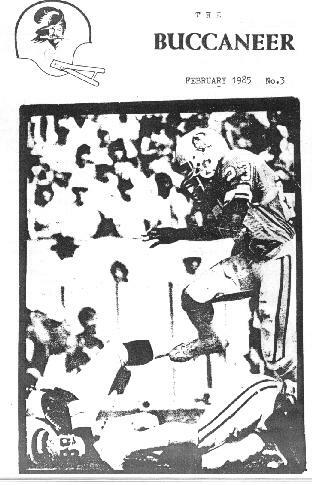 A letter appeared in the December 1984 issue of early UK american football magazine Gridiron UK asking if there were any other Tampa Bay fans out there in the UK. We wrote to the Bucs asking if starting a potential UK booster club was a feasible idea and began drafting an initial issue of a Bucs-related newsletter. The Bucs give their approval The arrival of a package air mail from Tampa that included a media guide, background information, a GameDay magazine and other details gave the go-ahead from the Bucs themselves. Rick Odioso was the team PR director at the time and he could not have been more supportive of the idea. 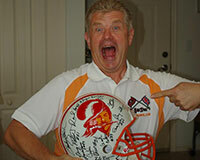 Five replies to the letter in Gridiron UK came back and the Bucs UK was formed. Membership quickly grew from there. The initial newsletters were pretty basic in terms of information and appearance. Six or seven pages of typed A4 on single-sided copies with only the most basic details of results and news. There was no internet, no USA Today available in this country and definitely no merchandise. The link with the Clearwater Bucs Bunch started in March 1985 after we had written to all six of the official Bucs' booster clubs in Florida. Incidentally, after all of these disbanded in the mid 1990s, we are the last one left. We also had our first piece of media coverage in issue 5 of The Buccaneer as it was known, and as Bob Henderson wrote about the formation of our club in The Clearwater Times. The first club meeting By issue 6, we were up to 11 members. We also had our first meeting planned for August, as the inaugural BritBowl was scheduled to take place at Villa Park. The London Ravens might have beaten the Streatham Olympians 45-6 on the field that day, but the get-together of half-a-dozen Bucs UK members outside the ground was a memorable one. We then had our first Bucs UK shirt which was proudly worn by all in the club, and we also had a big feature in The Clearwater Sun . The membership continued to grow and Rick Odioso continued to send us merchandise and magazines, the most notable of which were some of the Bucs' official 10-year patches that were given out to all the members. The first anniversary of the Bucs UK brought the membership to 27. Channel 4 had a Super Bowl party at The Video Cafe with live links hosted by Nicky Horne. Producer Gary Franses invited us out for a night of Bears, Patriots, free food and free beer. 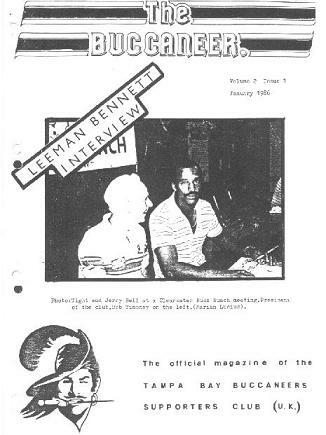 Issue 15 in March 1986 brought an interesting interview with the Bucs' Director of Player Personnel. Jim Gruden was his name. Perhaps we should have asked him about his son Jon at the time! 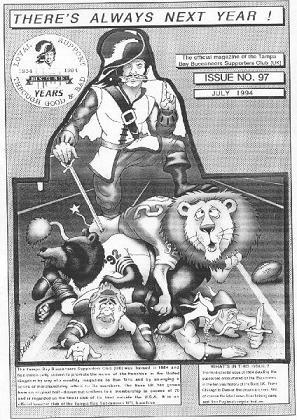 July 1986 and Gridiron UK ran a full page feature entitled "Me and My Team" which gave the Bucs UK some fantastic publicity. Bob and Lil Timoney came to the UK in the summer and brought over a bunch of souvenirs for the club and the membership reached 30. The first American Bowl The first American Bowl game took place at Wembley in August 1986 with the Bears playing the Cowboys. We invited the US Ambassador to a tailgate party out of the back of a Mini Metro - he declined, but invited a few of us to his official residence to meet the players and coaches of the team at an official lunch. Result! Trips to Tampa begin Interest in American Football and the Bucs had continued across the UK and in October 1988, following continued correspondence with Bill Thompson, we were planning for a trip across the Atlantic. The club was reinvigorated by this and the lauch of The Buccaneer which was sent to all the club contacts. 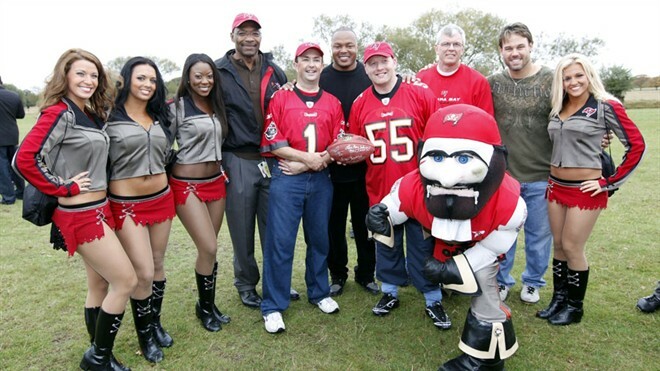 The Buccaneers used this Bucs UK visit as a huge publicity stunt and the 10 days were simply a blur. The Bucs UK were guest of honour at a Clearwater Bucs Bunch meeting, spoke at a business luncheon with Coach Ray Perkins, and then were invited down to One Buc Place to meet all the team on a Saturday morning. We were presented with a playing shirt and invited to watch the game the following day against the Bears from the team sideline. If you think you've seen football at close range from the stands then you haven't lived! Until Mike Singletary has gone barrelling in front of you tackling a Buc receiver, you don't realise just how hard these guys hit. The Bucs UK were interviewed by TV, radio and newspapers galore. We returned to the UK with a ton of free merchandise for club members including media guides, posters and badges. The club even managed to persuade a certain Mr. Nick Halling, then editor of Gridiron UK magazine, to run a feature on the trip in return for one of the cheerleader posters. And who said bribery and corruption never works? First Down's Allan Lees began a series of great references to the club in his weekly column. 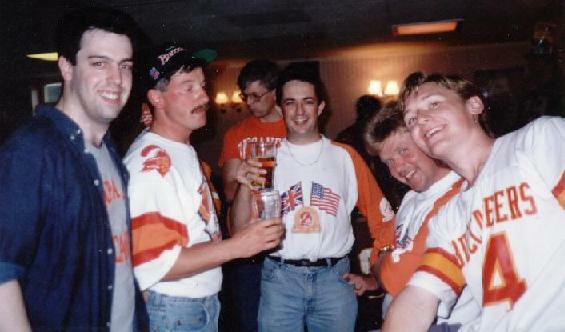 The American Bowl game that year featured Philadelphia and Cleveland and a bunch of us met at Wembley to form a small orange contingent in the stands. The Club was gaining momentum. 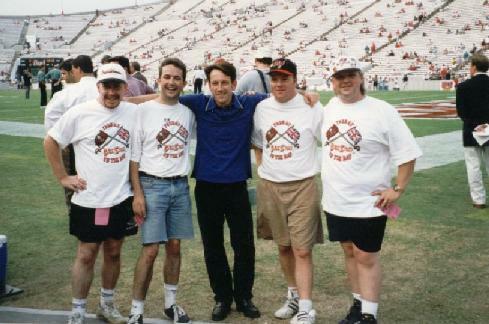 The 1989 club trip Members went on a club trip to Tampa in November 1989. 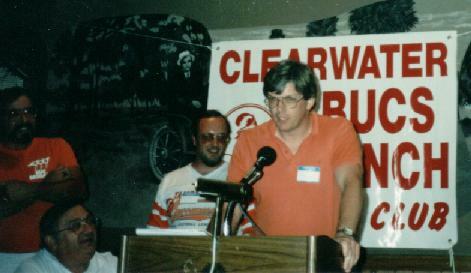 We took in home games against Minnesota and Cleveland and also addressed the Clearwater Bucs Booster Club one evening. The trip also resulted in one of the great practical jokes of the club's history when a couple of members convinced another to stand on a bridge at Busch Gardens to take their picture. Anyone who has been to Busch will know exactly which bridge too, the one over the Tidal Wave ride. That poor member naturally got soaked and the other two were left helpless with laughter for the rest of the trip. 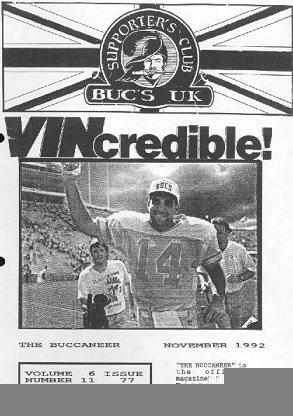 In March 1990, Lee Berry of First Down ran a full page feature on the cvlub founder that included a brief history of the Bucs UK and also a great piece from Rick Odioso of the Bucs whom they had got in touch with. The membership continued to grow and Mick Luckhurst became a good contact thanks to his weekly column in First Down. 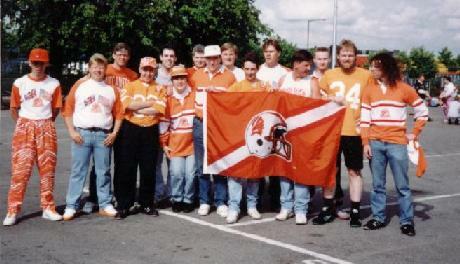 August 1990 brought nearly 25 club members to Wembley for the American Bowl game between the Raiders and Saints, and also a meeting in Walsall to discuss the long-term future of the Bucs UK. No-one recalls many great decisions being made but quite a lot of alcohol was consumed! Of course in these days, there was just blind faith that the Buccaneers were going to be successful the next season. Then we would lose a few games and the cry of "There's Always Next Year" would echo around the club leading to the change in name of the magazine. The 1990 club trip In October 1990, there was another trip to Tampa for a pair of home games against the Packers and Cowboys. Members ended up guests of honour at a Clearwater Bucs meeting when Harry Swayne didn't show up, but then joined him the following week instead when he insisted on buying us beer all evening to say thank you for covering him. Little did we all realise he would end up playing in four Super Bowls over the next decade as one of the NFL's best offensive tackles. Rick Odioso and the Bucs gave us boxes of merchandise for other club members and we were able to give all 48 club members, media guides, cards and an individual prize on our return. 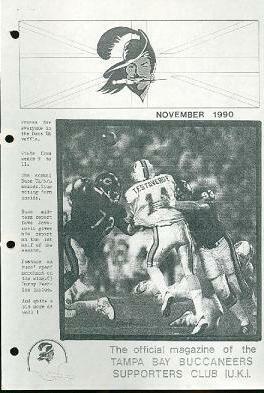 Some members were also interviewed by Buccaneer Radio during the Dallas game, the one where Troy Aikman hit Michael Irvin in the final minute for the game winner. Listening to that radio broadcast in another part of the stadium was another Brit who decided to get in touch - members came from all places! 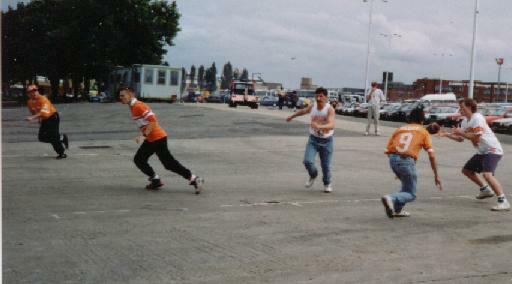 The Bucs UK touch football team The 1991 American Bowl saw the first touch football game arranged at Wembley as the Bucs UK took on the Steelers' fan club in the car parks before the game. We lost 24-12, but a great time was had and friendships formed. Mick Luckhurst took great delight in watching from the sideline and commenting that a Buccaneer team losing was nothing new to behold! 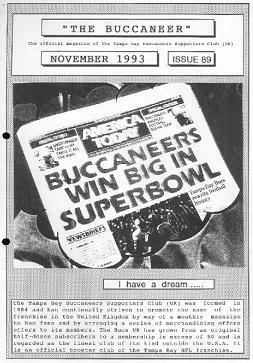 September 1991 saw the magazine nearly double in size, a new Bucs UK shirt come out and even work on sharing game videos too. Membership exceeded 50 for the first time and thanks to a good relationship with Channel 4's teletext operation, the club was getting membership enquires on a far more frequent basis. Rick Odioso was always helpful in supplying Buc information for the magazine and in arranging game tickets, although the Bucs were far from the point of selling out Tampa Stadium. 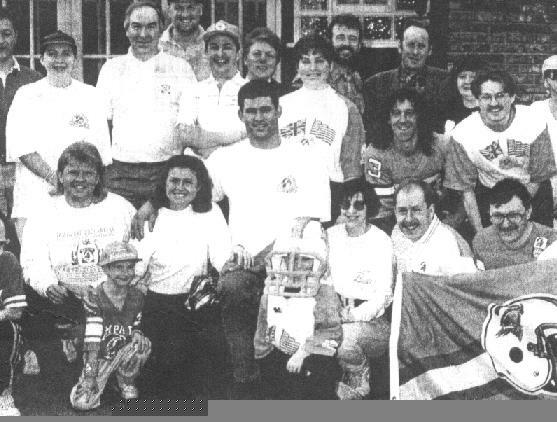 For 1992, we made the decision to increase the membership fee but to include a Bucs UK shirt with it. This proved to be one of the best moves the club ever made and gave us our own unique identity at NFL events. 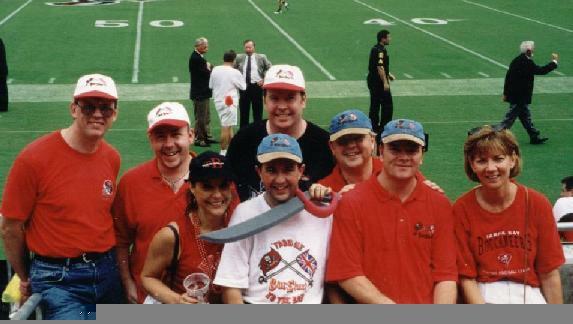 The American Bowl game at Wembley that year featured the Redskins and 49ers, but more importantly, featured a whole host of fan club events arranged by Bucs UK and Nick Barnes of the Atlanta club. We lost again to the Steelers club at touch football (it was closer! ), but the Bucs UK team won the American Football quiz competition, defeating the Redskins, Seahawks and London Olympians on the way. 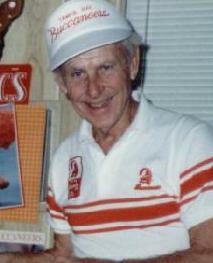 Many club members made the trip to Tampa to see the two season-opening wins under Sam Wyche in 1992. One member was asked to address 5,000-odd Bucs fans at a pre-game rally whilst a little the worse for drink, and asked everyone to:- "Give me a B, give me a U, give me a C, give me a K, give me an S - what have you got?" Err, the Milwaukee NBA team and a dyslexic Bucs UK fan to be honest! 1992 also saw the launch of the Bucs UK Fantasy Football League. 10 franchises took part in that first season and it was so small and insignificant to the highly-detailed and specialised league that it went on to become. Today, the league continues as a stand-alone entity with lifetime 'franchise' owners, a great (if drunked) draft day and one of the best websites you'll see. 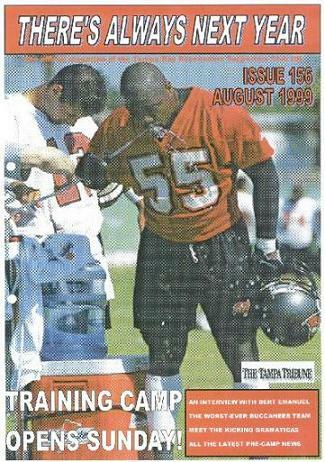 Charles McRae Day September 1992 brought the 75th issue of the magazine and the news that Bucs' offensive tackle, Charles McRae, would be visiting the UK the following spring and was happy to meet up with club members. McRae Day arrived the following February and around 50 people gathered at one member's home in Congleton to meet the former first round pick and his wife. First Down ran a full-page feature on the event and all concerned had a really great time. The final American Bowl game between Dallas and Detroit proved to be a disaster and Wembley was only half-full leading to no more pre-season games being scheduled in the UK. The magazine continued to grow thanks to weekly press releases being sent by Rick Odioso and Scott Smith of the Bucs, and the first appearance of Nick Pugliese occurred with the initial appearance of "Pugo's postcard from the Bay", a weekly piece from The Sporting News. 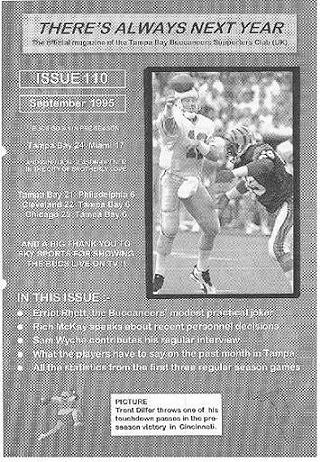 Sam Wyche offered to let the Bucs UK design a play to be used by the team, and the winning three entries were sent across to Tampa for inclusion in the 1994 Buccaneer playbook. May 30, 1995 was a sad day as Bob Timoney passed away in Clearwater. Bob was the life and soul of their Clearwater Bucs Booster Club and all those people who met him, got to know what a wonderful person he was. The Bucs UK decided to name its Buccaneer of the Year Award after Bob, the award being given to the person who most summed up his spirit and enthusiasm for the team in that period. 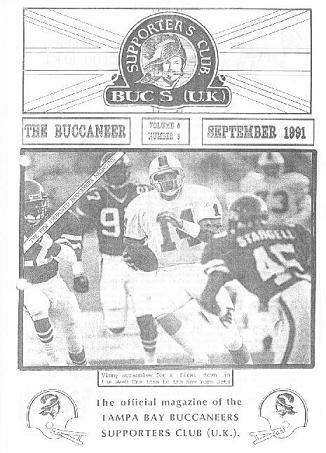 Sky Sports had begun broadcasting in the early 1990s and in 1995, the Bucs were finally shown live in the UK for the very first time. Naturally we lost to the Bears, and again later in the season to the Packers, a game livened up by First Down's Keith Webster holding up a copy of There's Always Next Year on screen in a blatant attempt to win the club's Writer of the Year Award. Either way, the membership exceeded 80 for the first time in the club's history. 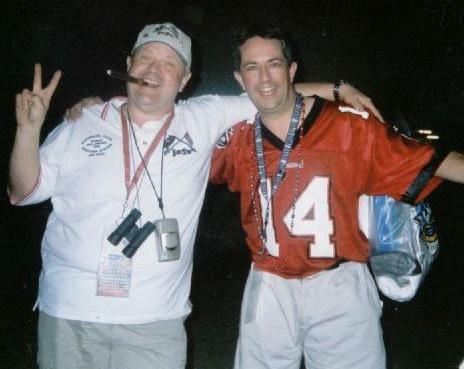 The World League of American Football returned in 1995 and the highlight was the Bucs' Casey Weldon playing for Barcelona and acknowledging a TD pass to the club's contingent in the stands. Facelift and New Technology The magazine was full of stories about the potential funding of a new stadium which would secure the franchise in Tampa Bay. 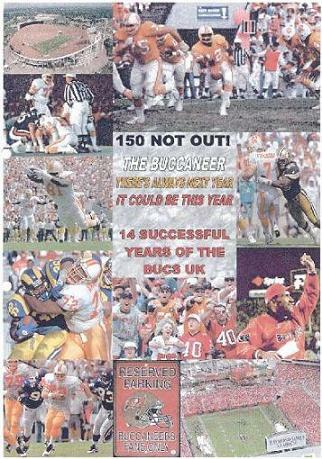 This came about in 1996, the first year under Tony Dungy and the 14th straight losing season for the Buccaneers. And to be the last. The Glazer family also announced plans to change the orange and white colours and Buccaneer Bruce logo. "These colours must definitely stay" wrote one member in the letters page of There's Always Next Year. The internet also heralded a turning point in the magazine and reporting on the club for Bucs UK members. No more re-typing every word from other articles. Suddenly a whole new world opened up and the content and appearance of the magazine changed almost overnight. 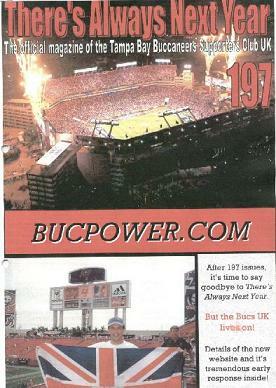 New Beginnings 1997 was a year of change and the first big club trip to Tampa - the glory days of the Buccaneers were about the begin. The new colours of pewter and red had been launched with great delight in April and there was a renewed optimism around the Bay area. Construction of the new stadium had begun next to the existing Tampa Stadium and great things were finally expected of the team. When the Bucs UK members arrived in Tampa, the Bucs were 3-0. We were invited to One Buc Place to meet Bryan and Joel Glazer and there began a great relationship between the Bucs UK and the new front office. We were given upgraded seats for the game and on-field passes for beforehand. Thanks to this, we got talking to Gary Imlach and led to us introducing Channel 4's coverage of the win over the Miami Dolphins. A great night was capped by a tremendous time with the guys from The Tampa Tribune which ended with us hosing down the walls of the rival St. Petersburg Times, a stunt still talked about fondly to this day. It is only a scandalous rumour that some of us then went into The Mons Venus until around 4 in the morning! The following week, even more Bucs UK members joined those already inTampa in watching the Bucs go to 5-0 with a win over the Arizona Cardinals and we ended up on the front page of the following morning's Tampa Tribune. One of our proudest moments of that trip came when Trent Dilfer came over to introduce himself to us at One Buc Place, leaving our jaws hanging in disbelief. 1997 saw the Bucs featured pretty frequently on Channel 4 and even on the German DSF channel too. We ended up in the playoffs for the first time since 1982 with some members piling into a West London pub to watch the games against Detroit and Green Bay live. A couple of members did a great impression of 50 Bucs fans in a bar from the inside of my car for Tampa radio - and the club membership continued to grow for real as well! The new stadium Bucs UK management had promised the Glazers that we would be back for the first game in the new stadium, and there we were on September 20, 1998. Mike Newquist, the Bucs' new ticket director, did us proud with a block of seats in the very front row behind the Bucs' bench and all the great aerial pictures of that first game against the Bears show us sitting proudly in the best seats in the house. 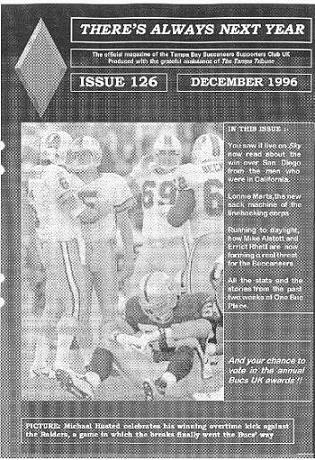 1999 gave the Bucs UK a chance to repay some of the great hospitality when Nick Pugliese came over to the UK during the off-season. We had a club get-together in London and then trested him to a trip to Old Trafford to see Manchester United clinch the Premier League title against Tottenham. We were by now fortunate to have the still-in-place ticket ordering facilitiy with the Bucs front office. A treat and honour we never take for granted and continue to appreciate. The Bucs UK were able to secure tickets for home games at a now-totally-soldout Raymond James Stadium. The magazine passed 150 issues and the membership went into three figures for the first time. In 2000, Bill & Linda Thompson came to the UK on a vacation and we put them up for a week as we were able to say thank you for their great friendship and hospitality over the years. Sky feature the Bucs UK During 2000, we were contacted by Sky's new producer of their NFL show, Karl Baumann. He wanted to do a piece about a UK fan club and naturally the Bucs UK were the prime choice. The five minute piece aired during the Bucs' playoff loss to the Eagles. This brought some great publicity to the club at a time when we were making the biggest change in the organisation's history. Going online For after 197 issues of There's Always Next Year, it was time to give up the magazine and switch to a website. The printing, collating, enveloping and stamping of some 150 copies of each magazine was growing tiresome. The first Bucs UK website went live in January 2001. It had some basic details on the club, details of merchandise etc. The membership cost of the Bucs UK had shrunk overnight as there were no more printing costs, and the overwhelming reaction of club members was that this was the way forward. When management made their annual vacation to Tampa in August, they were invited to meet Malcolm Glazer at half-time of the Miami pre-season game. News of the our online precense had gone around One Buc Place quickly. Super Bowl XXXVII Reward for the hard work were tickets for the Super Bowl in San Diego. Wow. The club celebrated its 20th anniversary in 2004 with special merchandise and the website went from strength to strength. All our game tickets for the 2005 season were upgraded by the Buccaneers to club level seating as a means of a thank you for the loyal support, and we began a regular appearance on the Ron Diaz & Ian Beckles Show on 620 Sports Animal which gave the club added publicity across the Bay area. Further club trips in 2006 and 2008 continued to add to the renown of the club. 2009 - Just.... wow Nothing will ever in the history of the Bucs UK will compare to the events of October 2009 when the Tampa Bay Buccaneers played in the International Series game at Wembley Stadium. The Bucs may have lost 35-7 to New England but the result was insignificant in comparison to the events of the weekend. We had hoped to arrange a couple of events for the Bucs UK to coincide with the trip but no-one could have expected what actually transpired. 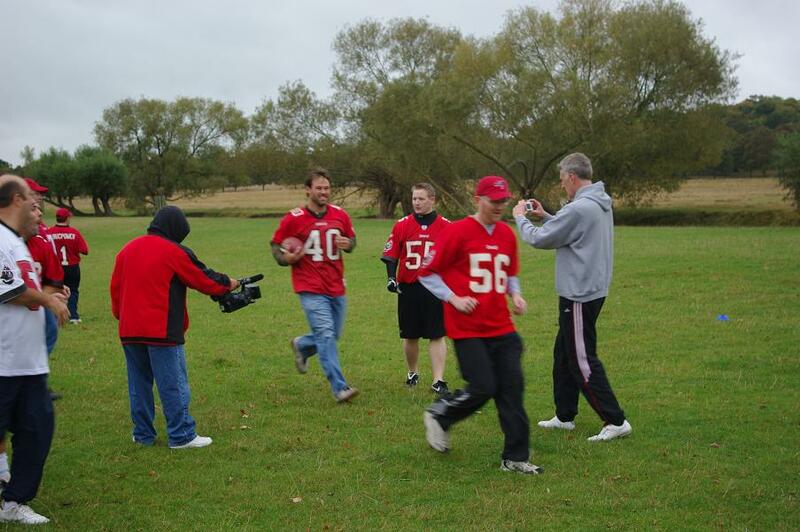 The Bucs UK team played a pair of touch football games against the UK Patriots and won both in front of many members of the printed, photographic and video media. The images went round the world the following day. The Buccaneers brought along Lee Roy Selmon, Mike Alstott and Shelton Quarles, together with cheerleaders and the team mascot. Any club member who was there that day will never forget it. A club meal that evening was followed the next day by a club get-together for NFL Films at the pre-game tailgate event. NFL UK had come through in helping the club secure two blocks of tickets behind the team bench ensuring the view of the game was simply magnificent. 2011 - Wow again! To Bucs UK members, 2009 would have been enough. We'd had the chance to host the Bucs at Wembley and had got involved thanks to our many friends there. 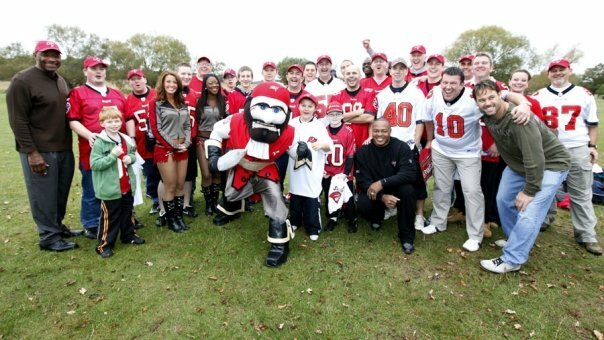 But in 2011 there was double the fun as the Bucs came back to Wembley for the International Series again... and later in the year the Bucs UK went en masse to Tampa thanks to an extraordinary offer by the Buccaneers. The 2011 Wembley experience for club members included exclusive 'behind the scenes' access to the Buccaneers training sessions, the best seats in the house for the fan rally in Trafalgar Square, a Club Meal with around 50 member attendees and a pre-game touch match against the UK Bears Fan Club (Beardown). 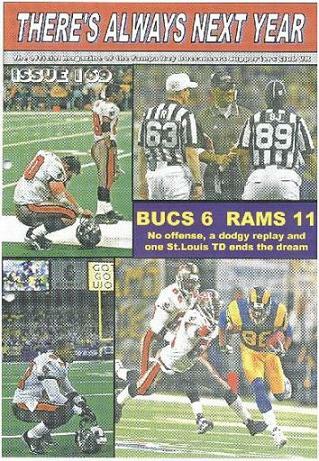 The game was filmed by Sky and featured Captain Fear and Sky host Neil Reynolds playing receiver for the Bucs UK. Oh, and he was catching passes thrown by Brad Johnson. Who was flanked by legends Jimmie Giles and Shelton Quarles who was happy to let us all try on his Super Bowl ring. All posed for photos and spent was must have felt like an eternity for them signing autographs and talking to us all. Oh, yes and then there was the match too but it was almost incidental by that point. The Buccaneers had very generously reach out to the club earlier in the year and invited us over for a game in Tampa. 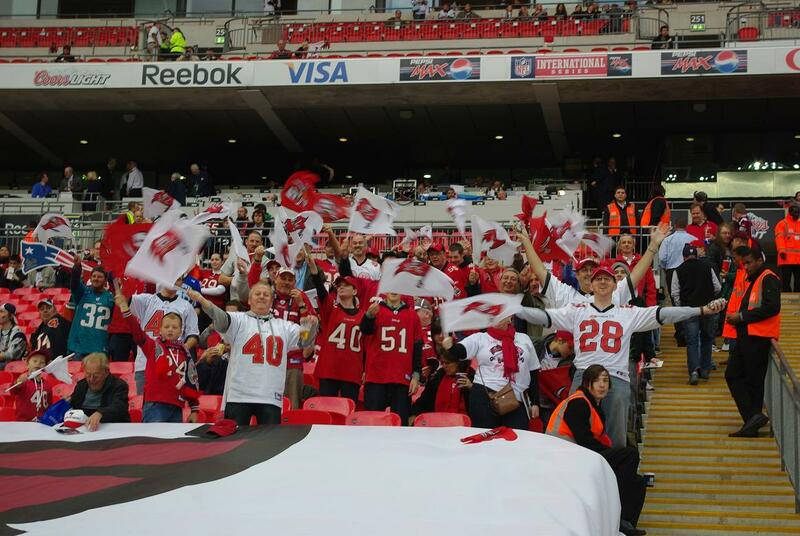 The response by Bucs UK members spoke volumes at the gratitude of our special relationship with the club we love. We were treated to a private guided tour around One Buc Place, enjoyed a club meal at Selmon's restaurant and had a great time at the game despite the loss to the Houston Texans. We also bombarded (sadly the late) Bucs'n'Bulls Heaven for our merchandise fix, others took in a tour of Raymond James Stadium and various other local sporting fixes. In 2012, some fortuitous scheduling meant that the Bucs UK could meet up in New York for the Bucs and the Rays. Allegedly there was also a bit of alcohol consumed, but no-one can really remember enough to vouch for this. At the end of 2012, the then management stepped down. Enter Phil Jones, David Cambridge and Kieron Hyams. Following the previous resignation, the club has been taken over by the current committee who are, along with the club members, keen to ensure the club continues to go from strength to strength. The Bucs UK launched a new website. The ease of online communication and rise of social media led membership to creep over the 200 mark. This was helped by the introduction of family membership - underpinning the club's ethos as being family friendly and geared towards soldifiying the friendships between memebrs and fellow fans. The membership cost was also reduced to its lowest level to ensure members got the best possible value. As lesser known Tampa Bay Bucs fan Sir Winston Churchill put it: "Now this is not the end. It is not even the beginning of the end. but it is, perhaps, the end of the beginning". We agree - there are great things ahead for this club so long as there are fans out there that care enough to read this far down the page....!